Everyone comes to Santorini to enjoy the sunsets, the amazing views, the romantic restaurants and so on. But if you are looking to do something different while you are here, there are a few hiking trails you can also enjoy. 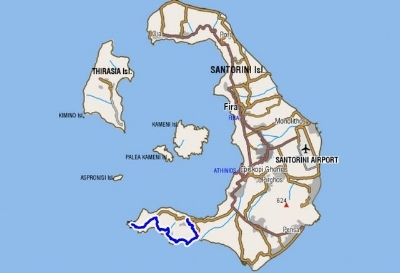 Here is a list with the main hiking routes in Santorini. There is a map for every route, with details about the difficulty, altitude, starting and finishing points as well as some photos from the hike. At the end of the article you will also find a few hiking tours in Santorini I would recommend if you are looking to book one. Let's go for a walk around the island, shall we? To begin with, let's see the most famous hiking route on Santorini. This is the one that will take you from Fira to Oia. It is number one activity on TripAdvisor. This trail has spectacular views to the caldera and the volcano. Moving along the edge of the caldera cliffs, you can start from the main square in Fira. On the way you will pass through the beautiful towns of Firostefani and Imerovigli and then head to the northern part of Santorini, where Oia is. Most people only walk one way and then take the bus back. You can also start from Oia if you prefer and walk back to Fira. Read more about Fira and Oia. This wide cobbled path will take you up to the highest point of Santorini, where the Monastery of Prophet Elias is. The panoramic views from the top are amazing and this is the only spot where you can see the whole island. The monastery itself is very interesting, since it dates back to 1711. Up there you will also get a chance to take a break and enjoy some traditional treats monks make. If you want a different (shorter) route to the Monastery you can follow another beautiful path to discover the church of Saint George or as we call it in Greek "Agios Georgios" also known as "Katefyo". Built in 1754 into the mountain, this chapel is west of Pyrgos, literally in the middle of nowhere. The name "Katefyo" means "shelter/refuge". A local story says that a princess found shelter in this church once, to escape pirates that were chasing her. Thus comes the name. If you feel like walking a bit further, after the Monastery you can continue walking to get to Ancient Thira. The ruins of Ancient Thira are 360m above sea level. The city was named after the mythical ruler of the island, King "Theras" and was inhabited from the 9th century BC until 726AD. In addition to the fascinating history and the ancient ruins, this site offers greats views over the cliffs that drop into the sea. From Ancient Thira, you can then walk down to the beach. Either Kamari Beach or Perissa Beach. This route will take you down to a more touristic side of Santorini, where Kamari is. Kamari is one of the beaches with black sand in Santorini. If you are looking for a longer route then you can reverse this one, so start from Kamari beach, walk up to Ancient Thira and then continue to go down to Perissa beach. Read more about Santorini beaches. Similar route to the previous one. However Perissa is a nicer beach if you want to go swimming. In terms of things to do, both Kamari and Perissa have plenty of activities on the beach as well as beach bars, restaurants and some shops. The main difference is that Perissa has finer sand than Kamari which makes it more enjoyable to walk on. On the other hand Kamari has a lovely promenade right by the beach and more shops. This is a less famous route, but still lovely. You will be starting at the traditional village of Megalochori and along the way you will get a chance to see a couple of beautiful small churches, the famous heart of Santorini and the old Thermal Baths of Plaka. There are still cave houses and a few buildings down there and you will also get to see the hot springs. Nice and quiet route, away from the crowds with amazing caldera views. There are not many beaches on this side of the island, so this is really a unique sight. Heading further south in Santorini, there are a few hiking routes that will take you to the traditional town of Akrotiri. Either from Megalochori or from Emporio. Connecting two traditional villages of Santorini, this route will give you a chance to enjoy the views and see the more traditional side of Santorini as well. A similar, but shorter route is the one below connecting Emporio Village to Akrotiri. Another "traditional" route as I call them. You will walk through the vineyards of Santorini and you either finish at the Akrotiri excavations or you can walk further down to see the red sand beach. This is a great route combining history with sightseeing. It will not take you long (less than half an hour) and it is definitely worth visiting both places. This hiking trail is more difficult compared to the previous ones so make sure you can handle it. Starting from Akrotiri excavations, you will then see the village of Akrotiri and continue to the hidden caldera beach "Balos Bay". You could always split it in half and do either the first bit or the second. Once you get to the village of Akrotiri, you can head to the left instead of the right and walk all the way to the end of the path where the Lighthouse is. I couldn't find a map similar to the other ones, but there is this website called topoguide that has all the hiking trails in Santorini (and many routes around Greece actually). You can click on this link to visit their website and see the interactive map. You can see the hiking trail with the blue line on the south side of Santorini. Click on the map to visit the topoguide website and see the details. The same website also offers an app you can download, check it out. The two volcanoes that are now in the middle of the island were both formed after the "Caldera" was created. “Palia Kameni” (the larger one) was gradually formed between 19 and 726 AD, whereas “Nea Kameni” (the smaller one) was formed later, in 1573. Read more about Santorini history. Nowadays from the Old Port in Fira, there are small boats that will take you across to the volcano. Once you are there you can hike to the top. This is even more fascinating if you are into geology. Please keep in mind that the weather can be very hot in the summer and this is an island made of black lava. So it basically reflects all the heat and makes it even hotter. Bring a lot of water and wear the right shoes (sandals are not the right shoes as you will burn your feet). Interesting fact: Caldera is actually a Spanish word and stands for a big boiling pot. Which is exactly what this is. Imagine magma boiling inside the volcano, and then exploding into the air, leaving the crater empty behind. Magma was supporting all the rocks above the volcano and with it gone, the crater would then collapse into the sea, creating the caldera. Last but not least, if you are just looking for a nice walk by the beach, you can try this path. It is short and fairly easy to do. The landscape is really cool- feels like you are walking on the moon if you ask me. Plus you can combine it with a swim. And in the heat of the summer this is as good as it gets. Now if you want to go on a hiking tour in Santorini, here are the ones I would suggest. If you have walked any other cool paths in Santorini please do share them below.